From outdoor festivals to state parks, Tampa is an exciting place for family vacations. The sunny, mild weather makes outdoor exploration feasible year round. Read our guide to the best outdoor activities for kids and families around Tampa. Tampa’s modern history began in the mid-1800s when the downtown area was developed at the mouth of the Hillsborough River. The city was eventually incorporated and additional neighborhoods developed like Ybor City, a commercial hub north of downtown populated by immigrants from Spain, Cuba and Italy whose main industry was cigar manufacturing. Today, the Tampa Bay area is a thriving and diverse destination with many outdoor activities fun for the whole family. With Tampa Bay spanning 400-square miles, fed by hundreds of small tributaries and opening up to the Gulf of Mexico, it’s a unique ecosystem with ample opportunities to explore and discover its natural beauty. From natural springs to state parks, Tampa is an exciting place for family vacations. The sunny, mild weather makes outdoor exploration feasible year round with summertime average temperatures in the mid-80s and wintertime in the mid-60s. Read on for the top outdoor activities for kids and family vacations in Tampa. 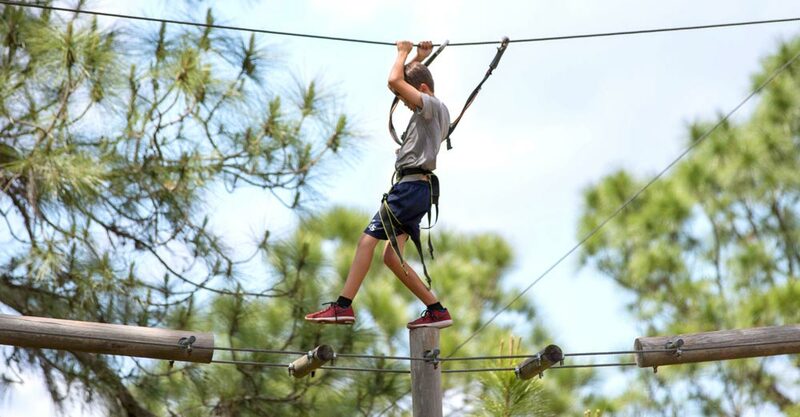 For a day of excitement in the great outdoors, swing by our Bradenton adventure course. TreeUmph! is an aerial adventure course in the trees where you’ll zip, climb, swing and soar across hundreds of obstacles like swinging ropes, suspended bridges and hanging nets, all while safely harnessed to the course. With a variety of different courses designed for children, juniors, adults and seniors, everyone in the family will be challenged in a fun and adventurous environment. Tampa is home to a host of natural springs. These magical freshwater pools are an incredible place to swim, snorkel, kayak, fish and commune with nature. Take your pick from destinations like Rainbow Springs, Eureka Springs and Lettuce Lake Park. At Lithia Springs, you can swim through the crystal clear water that remains a constant 72 degrees year round. It’s fed by the Alfalfa River, which makes for excellent canoeing and kayaking where you’re likely to spot manatees, dolphins and wading birds. Head to Clearwater Beach’s famous Pier 60 for the sunset and then stick around for Sunset Cinema. This free outdoor movie series takes place Friday through Sunday evenings where family-friendly movies like Cars, Apollo 13 and Transformers are projected onto the big screen. Pack a picnic, bring a blanket and buy snacks at the concession stand to enjoy this unique movie-going experience under the stars with the sound of the gulf in the distance. Keep it cool and let the little ones run wild at one of Tampa Bay’s many Splash Parks and Spraygrounds. Choose from Ballast Point Park, Perry Harvey Sr. Park, Curtis Hixon Waterfront Park and Cotanchobee Fort Brooke Park. At Water Works Park, an extension of the Riverwalk in the heart of Tampa, kids can pull giant yellow buckets overhead for a full soak. There’s also a traditional playground, dog park and picnic areas. At the northern edge of Tampa Bay in Oldsmar, head to Burbank Road on Saturdays March through October for a free water ski show starting at 5:30 p.m. These one-of-a-kind productions take on different themes every week, ranging from Motown to country to 80s music. You’ll watch water skiers perform a variety of tricks and formations, including a four-level pyramid that you won’t believe! Spend the Fourth of July in Tampa and come out for the Tampa Red White & Blue Festival at Cotanchobee Park. This free festival boasts a food court, best dressed patriotic contest, art zone with local crafters, raffles and giveaways, an apple pie eating contest, plus plenty of fun and live entertainment for the whole family. Afterwards, head to the Tampa Bay waterfront to enjoy a fireworks spectacular. Buccaneer Bay is a waterpark surrounding the natural Weeki Wachee Springs. There’s a sandy white beach and a lazy river where you can rent floats and enjoy the natural current. To add to the fun, there are four waterslides that flow into the springs where you can make a true splash. The legendary Mermaid Show is the top attraction here and shows are performed three times daily inside a submerged 400-seat auditorium. Real life mermaids swim through the spring and perform synchronized swimming ballets of the Little Mermaid and Fish Tails. There are a wide variety of state parks in the Tampa Bay area to commune with nature and the great outdoors. Some of our favorites include Caladesi Island State Park located on a barrier island at the northern edge of the Tampa Bay area across St. Joseph Sound and west of Dunedin where shelling, swimming, fishing and hiking are popular activities. Located inland, Hillsborough River State Park is one of Florida’s oldest established state parks where you can go canoeing, bike riding, swimming and hiking. South of the Tampa Bay area, Little Manatee River State Park is a popular destination for hiking, canoeing, horseback riding and camping amidst a truly unique ecosystem.